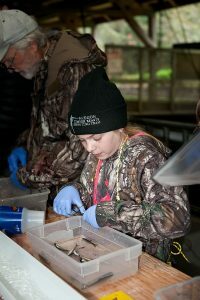 There are many “experienced” volunteers at the 30th annual Whiskey Creek Fish Hatchery fin-clipping event. This young lady has been coming for “years”; her efficient technique and stayed at the table throughout the morning. Tillamook Anglers have been supplementing hatchery fish on Tillamook County rivers since 1989 through volunteer efforts at the Whiskey Creek Fish Hatchery.